This chemistry dictionary offers the chemistry definitions starting with the letter C. These glossary terms are commonly used in chemistry and chemical engineering. Click the letter below to find the terms and definitions beginning with that letter. cadmium – Cadmium is the name for the transition metal element with atomic number 48 and is represented by the symbol Cd. caffeine – Caffeine is a chemical substance naturally found in tea and coffee and added to colas. calcium – Calcium is the name for the alkaline earth element with atomic number 20 and is represented by the symbol Ca. calibration – Calibration is the process of determining the relation between the output or response of a measuring instrument and the value of the input. Calibration typically involves the use of a measuring standard. californium – Californium is the name for the actinide element with atomic number 98 and is represented by the symbol Cf. calomel – Calomel is a common name for the compound mercury chloride, Hg2Cl2. calorie – A calorie is a unit of thermal energy equal to 4.184 joules or the amount of energy required to raise the temperature of 1 gram of liquid water 1°C at standard pressure. A food calorie is equal to 1 kilocalorie or 1000 heat calories (4184 J). calorimeter – A calorimeter is a device used to measure the heat flow of a chemical reaction or physical change. calorimeter constant (C) – Denoted by ‘C’, the calorimeter constant is the product of the mass multiplied by the specific heat of a bomb calorimeter. calorimetry – Calorimetry is the study of measuring heat changes from chemical reactions or physical changes. calx – Calx is an oxide of a metal. In early chemical history, when a substance was burned and phlogiston was removed. The residue left behind was called calx of what was burned. calx of lead – Calx of lead is a deprecated chemical term for lead oxide compounds. calx of mercury – Calx of mercury is a deprecated chemistry term for the compound mercury oxide, HgO. candela – Candela is the SI unit for measuring luminous intensity. A candela (cd) is defined as the luminous intensity in a given direction of a monochromatic source of 540 nm light that has a radiant intensity of 1/683 watts per steradian. Example: A common candle has the luminous intensity close to one candela. capillary action – Capillary action describes the spontaneous flow of a liquid into a narrow tube or porous material. Capillary action is caused by the combination cohesive forces of the liquid and the adhesive forces between the liquid and tube material. These forces pull the liquid into the tube. capsid – A capsid is a shell or coating made up of proteins around a virus’ genetic material. capsomere – A capsomere is the basic subunit protein in the capsid of a virus. carat – A carat is a unit of mass for gemstones and pearls. One carat is defined to be equal to 200 milligrams. Common Misuse: karat is a measure of purity. carbanion – A carbanion is a carbon atom which has a negative electrical charge. A carbon anion. carbenium – Carbenium is a carbocation with three valence electrons. carbocation – A carbocation is any carbon cation. The carbocation with three valence electrons is called carbenium. Carbocations with five or six valence electrons are called carbonium ions. carbodiimide group – The carbodiimide group is a functional group with formula RN=C=NR. Carbodiimide compounds are used to couple peptide molecules. carbohydrate – Carbohydrates are a class of organic compounds having the general formula Cm(H2O)n.
Examples: Glucose, fructose, sucrose, starch, cellulose are all carbohydrates. carbon – Carbon is the name for the nonmetal element with atomic number 6 and is represented by the symbol C.
carbonate – Carbonate is an ion consisting of one carbon and three oxygen atoms. The molecular formula for the carbonate ion is CO32-. Carbonate also refers to any compound containing the carbonate ion. carbonate ion – A carbonate ion is the chemical species CO32-. carbon black – Carbon black is a nearly pure elemental carbon formed from controlled combustion of petroleum hydrocarbons. It has no set crystal structure and is usually found as a fine powder or in pellet form. Carbon black is used mainly as a coloring and reinforcing agent in rubber production and as the toner for photocopiers and laser printers. carbon-carbon bond – A carbon-carbon bond is a covalent bond between two carbon atoms in a molecule. carbon-carbon double bond – A carbon-carbon double bond is a double bond between two carbon atoms in a molecule. Example: Ethylene (C2H4) is a hydrocarbon with a carbon-carbon double bond. carbon-carbon triple bond – A carbon-carbon triple bond is a triple bond between two carbon atoms in a molecule. Example: Acetylene is a hydrocarbon with a carbon-carbon triple bond between the two carbon atoms. carbonium ion – Carbonium ions are carbocations with either five or six valence electrons. carbonyl – carbonyl refers to the carbonyl functional group which is a divalent group consisting of a carbon atom with a double-bond to oxygen. The general form of a carbonyl group is RCOR’. Compounds with this group are prefixed with either keto- or oxo- or the -one suffix is added. Carbonyl also may refer to a compound formed by a metal with carbon monoxide. carboxylation – Carboxylation is a chemical reaction where a carboxylic acid functional group is introduced into a substrate. carboxylyase – A carboxylase is a lyase which catalyzes a reaction to add or remove a carboxyl group from a compound. carboxyl group – The carboxyl group is an organic functional group consisting of a carbon atom double bonded to an oxygen atom and single bonded to a hydroxyl group. The carboxyl group is commonly written as -C(=O)OH or -COOH. carboxylic acid – Carboxylic acid is an organic compound containing the COOH functional group. Example: Acetic acid, CH3COOH, is a carboxylic acid. carboy – A carboy is a large container, usually made of glass, capable of holding 5 to 15 gallons of liquid. carcinogen – A carcinogen is a material that causes or is suspected to cause cancer. caramelization – Caramelization is the process of oxidizing sugar. carotenoid – Carotenoids are a family of natural pigments found in plants and animals. Plants are the source of the carotenoids found in animals. catabolism -Catabolism is the decomposition of complex molecules into simpler molecules by chemical reactions. catalysis – Catalysis is the acceleration (or deceleration) of a chemical reaction due to the presence of a catalyst. catalyst – A catalyst is a substance that increases the rate of a chemical reaction by reducing the activation energy, but which is left unchanged by the reaction. Example: A piece of platinum foil is a catalyst for the combustion of methane in air. catalytic cracking – Catalytic cracking is the process of cracking in the presence of a catalyst. catenation – Catenation is the binding of an element to itself through covalent bonds to form chain or ring molecules. Carbon is the most common element that exhibits catenation. It can form long hydrocarbon chains and rings like benzene. cathode – A cathode is the electrode at which reduction occurs. Cations are attracted to the cathode. Generally, the cathode is the negative electrode. cathode ray – A cathode ray is an electron emitted from a cathode in a vacuum tube. cathode ray tube – A cathode ray tube is a type of vacuum tube which contains a source of electrons and a fluorescent screen, with some means to accelerate and deflect the electron beam. Cathode ray tubes commonly are used to form images on the fluorescent screen. cation – A cation is an ionic species with a positive charge. causality principle – The causality principle is the fundamental principle of science where every event has a cause and the cause precedes the event. cavitation – Cavitation is boiling of a liquid that is caused by a decrease in pressure rather than by an increase in temperature. cell potential – Cell potential is the potential difference between the cathode and anode of an electrochemical cell. Celsius temperature scale – The Celsius temperature scale is a common but non-SI temperature scale which is defined by assigning the temperatures of 0°C and 100°C to the freezing and boiling points of water, respectively. ceiling limit – Ceiling limit refers to the concentration of a chemical or material that no person should be exposed to for any period of time to prevent ill effects or death. Example: The ceiling limit for ammonia (NH3) is 50 parts per million for 5 minutes. centi – Centi is the prefix associated with x10-2 and is denoted by the symbol c.
Example: The width of a fingernail is approximately 1 centimeter or 1⁄100 m.
ceramic – A ceramic is a material constructed from inorganic, nonmetallic materials and then heated to change their physical properties and allowed to cool. Ceramics are often more heat and corrosion resistant than metallic or polymer materials. Examples: Glass and pottery are both common ceramic materials. cerium – Cerium is the name for the lanthanide element with atomic number 58 and is represented by the symbol Ce. cesium – Cesium is the name for the alkali metal element with atomic number 55 and is represented by the symbol Cs. cetane number (CN) – The Cetane Number (abbreviated CN) refers to the combustion quality of diesel fuel. It represents the time delay between the start of injection process and the point where the fuel ignites. This value is determined by the % volume of cetane or hexadecane (C16H34) in isocetane that provides the identical ignition delay of the measured fuel sample. CFC – A CFC is an abbreviation for chlorofluorocarbon. CFCs are compounds that contain atoms of chlorine, fluorine, and carbon. Example: Dichlorodifluoromethane or Freon-12 is a CFC. CGS units – CGS units form the system of measurement based on the centimeter for distance, gram for mass and second for time. CGS units were used in the study of mechanics before the adoption of the metric and SI systems of measurement. chain molecule – A chain molecule is a molecule made up of a series of atoms or molecules bonded together in a row. Examples: Many simple hydrocarbons are chain molecules with a central row of carbon atoms. Polymers are chain molecules where the chains are made from basic unit molecules. chain reaction – A chain reaction is a series of reactions where the products contribute to the reactants of another reaction without outside influence. A nuclear chain reaction is a fission reaction where the neutrons generated by the fission process go on and initiate fission in other atoms. chalcogen – Chalcogen is the name given to a member of periodic table group 16 (old-style: VIB or VIA) in the periodic table. Chalcogens are sometimes known as the oxygen family. The chalcogens are the elements oxygen (O), sulfur (S), selenium (Se), tellurium (Te), polonium (Po), and livermorium (Lv). The compounds of the heavier chalcogens (the sulfides, selenides, and tellurides) are known as chalcogenides. chaotropic – Chaotropic is the ability of a substance to interfere with hydrogen bonding and van der Waals forces. Chaotropic agents are compounds that can interfere with protein and polymer stability. They can be added to break apart or alter the three-dimensional structure of polymers. Chaotropic agents are denaturants. charge – In the context of chemistry, charge usually refers to electric charge, which is a conserved property of certain subatomic particles that determines their electromagnetic interaction. Examples: By convention, electrons have a charge of -1 while protons have a charge of +1. Charles’s law – Charles’s Law is an ideal gas law where at constant pressure, the volume of an ideal gas is directly proportional to its absolute temperature. chelate – A chelate is an organic compound formed when a polydentate ligand binds to a central metal atom. chelating agent – A chelating agent is a ligand that can form a chelate with a metal atom. Example: The oxalate ion [O-C(=O)-C(=O)-O]2- is a chelating agent. chemical – Everything which has mass is a chemical. Anything consisting of matter is a chemical. Any liquid, solid, gas, any pure substance or any mixture are all chemicals. chemical change – A chemical change is a process where one or more substances are altered into one or more new and different substances. chemical energy – Chemical energy is the energy contained in the internal structure of an atom or molecule. This energy could be in the electronic structure of a single atom or in the bonds between atoms in a molecule. Chemical energy is converted into other forms of energy by chemical reactions. chemical engineering – Chemical engineering is applied chemistry. It is the branch of engineering concerned with the design, construction, and operation of machines and plants that perform chemical reactions to solve practical problems or make useful products. chemical equation – A chemical equation is a shorthand written description of what happens in a chemical reaction. It includes the reactants, products, direction(s) of the reaction, and may also include charge and states of matter. chemical equilibrium – Chemical equilibrium is the state of a chemical reaction when the concentrations of the products and reactants are unchanged over time. chemical formula – An expression which states the number and type of atoms present in a molecule of a substance. Example: There are 6 C atoms and 14 H atoms in a hexane molecule, which has a molecular formula of C6H14. chemical kinetics – Chemical kinetics is the study of chemical processes and rates of reactions. chemical physics – Physical chemistry is the branch of chemistry that is concerned with the application of physics to chemical systems. This may involve the application of the principles of thermodynamics, quantum mechanics, quantum chemistry, statistical mechanics and kinetics to the study of chemistry. chemical property – A chemical property is a property or behavior of a substance when it undergoes a chemical change or reaction. Examples: Chemical properties of a substance can include toxicity, oxidation, and flammability. chemical reaction – A chemical reaction is a chemical change which forms new substances. Example: The chemical reaction H2(g) + ½ O2(g) → H2O(l) describes the formation of water from its elements. chemical symbol – A chemical symbol is a notation of one or two letters representing a chemical element. Examples: H is the chemical symbol for hydrogen, C is the chemical symbol for carbon, Si is the chemical symbol for silicon. chemiluminescence – Chemiluminescence is a type of chemical reaction where electromagnetic radiation is one of the products. Example: The reaction between luminol and oxalate used in glow sticks is a chemiluminescence reaction. chemistry – Chemistry is the scientific study of matter, its properties, and interactions with other matter and with energy. Cherenkov radiation – Cherenkov radiation is the electromagnetic radiation emitted when a charged particle moves through a dielectric medium faster than the velocity of light in the medium. Examples: The distinctive blue glow around nuclear reactors is caused by Cherenkov radiation. chiral center – A chiral center is defined as an atom in a molecule that is bonded to four different chemical species, allowing for optical isomerism. Example: The central carbon in serine is a chiral carbon. The amino group and hydrogen can rotate about the carbon. chirality – Chirality or chiral describes a nonsuperimposable mirror image, like left and right hands. Usually, in chemistry, the term is used to describe a pair of molecules that have the same formulas but form a different pair of structures. chlorate – A chlorate is an anion with the formula ClO3–. A chlorate can also be a compound containing the chlorate anion. Chlorate followed by a Roman numeral shows the oxidation state of the chlorine atom. Example: Chlorate(V) is the anion where chlorine is in the +5 oxidation state. Chlorate(III) is the anion where chlorine is in the +3 oxidation state (chlorite anion). chloride – A chloride is any chemical compound in which one or more chlorine atoms are covalently bonded within the molecule. The term chloride may refer to any salt of hydrochloric acid, HCl, which contains chloride ions. Chloride ions form when the element chlorine picks up an electron to form an anion Cl−. chlorinated hydrocarbon – A chlorinated hydrocarbon is a hydrocarbon molecule where one or more hydrogen atoms have been replaced by chlorine atoms. Example: Chloroform is a chlorinated hydrocarbon. chlorination – Chlorination is a process where a substance is combined with chlorine. Chlorination also refers to the treatment of water to kill microorganisms and oxidize several organic contaminants. chlorination reaction – A chlorination reaction is a chemical reaction where a chlorine atom is integrated into a molecule. chlorine – Chlorine is the name for the halogen element with atomic number 17 and is represented by the symbol Cl. chlorite – A chlorite is an anion with molecular formula ClO2–. Chlorites can also refer to compounds containing the chlorite anion. chlorocarbon – A chlorocarbon is an organic compound that contains one or more chlorine atoms. Example: Chloroform is a chlorocarbon. chlorofluorocarbon – A Chlorofluorocarbon is a compound that contains atoms of chlorine, fluorine, and carbon. Example: Dichlorodifluoromethane or Freon-12 is a chlorofluorocarbon. cholesteric – Cholesteric refers to a type of liquid crystal where the molecules of the liquid crystal are arranged in parallel layers and each layer’s molecules are rotated slightly different from the layer above and below it. chromate – Chromate is an inorganic polyatomic anion with molecular formula CrO42-. Chromate compounds are good oxidizers. chromate compound – A chromate compound is a compound containing the chromate anion (CrO42-). Chromate compounds are salts that are weak bases and strong oxidizers. chromatography – Chromatography is a group of laboratory techniques to separate the components of a mixture by passing the mixture through a stationary phase. chromite – Chromite is an anion complex containing the chromium(III) ion (Cr3+). Examples: CrO2– and [Cr(OH)6]3- are both chromite anions. chromium – Chromium is the name for the transition metal element with atomic number 24 and is represented by the symbol Cr. chromophore – A chromophore is the part of a molecule that absorbs or reflects light. Chromophores determine the color of a molecule. circuit – A circuit is a closed path through which electric current can flow. The current can flow in the form of free electrons or as ions. closed system – A closed system is a type of thermodynamic system where mass is conserved within the boundaries of the system, but energy is allowed to freely enter or exit the system. coagulation – Coagulation is a gelling or clumping of particles, typically in a colloid. The term typically applies to the thickening of a liquid or sol, usually when protein molecules crosslink. Examples: Milk proteins coagulate to thicken the mixture that forms yogurt. Blood platelets coagulate blood to seal a wound. Pectin gels (coagulates) a jam. Gravy coagulates as it cools. cobalt – Cobalt is the name for the transition element with atomic number 27 and is represented by the symbol Co.
coenzyme – A coenzyme is a substance that works with an enzyme to initiate or aid the function of the enzyme. Coenzymes cannot function on their own and require the presence of an enzyme. Example: The B vitamins serve as coenzymes essential for enzymes to form fats, carbohydrates, and proteins. cohesion – Cohesion is the attractive force between like molecules. Cohesion is the measure of how well molecules ‘stick’ or group together to themselves. collagen – Collagen is a group of proteins made up of amino acids. They are the most common proteins found in humans and mammals. colligative properties – Colligative properties are properties of solutions that depend on the number of particles in a volume of solvent and not on the mass of the particles. Examples: Vapor pressure and freezing point depression are examples of colligative properties. colloid – A type of homogeneous mixture in which the dispersed particles do not settle out. Examples: Butter, milk, smoke, fog, ink, and paint are all colloids. columbium – Columbium was the original name for the element niobium. The name columbium is still occasionally used in metallurgy. combined gas law – The combined gas law combines the three gas laws: Boyle’s Law, Charles’ Law, and Gay-Lussac’s Law. It states the ratio of the product of pressure and volume and the absolute temperature of a gas is equal to a constant. Example: C + O2 → CO2, or the burning of carbon in the presence of oxygen to produce carbon dioxide is a combination reaction. combustion – Combustion is a chemical reaction chemical that occurs between a fuel and an oxidizing agent that produces energy, usually in the form of heat and light. combustion reaction – A combustion reaction is a type of chemical reaction where a compound and an oxidant is reacted to produce heat and a new product. CH4 + 2 O2 → CO2 + 2 H2O + heat are both combustion reactions. common-ion effect – Common-ion effect describes the suppressing effect on ionization of an electrolyte when another electrolyte is added that shares a common ion. compound – A compound is a chemical species that is formed when two or more atoms join together chemically, with covalent or ionic bonds. Also known as: molecule, though sometimes distinctions are made between the types of bonds in molecules (covalent) and compounds (ionic). common name – A common name is a historical name for a compound. Examples: Ethylene glycol is the common name for ethane-1,2-diol. Acetone is the common name for propanone. Baking soda is the common name for sodium bicarbonate. Complementarity Principle – The Complementarity Principle states that a system can exhibit wave-like behavior and particle-like behavior, but no experiment could demonstrate both behaviors simultaneously. complete combustion – Complete combustion is a combustion reaction that consumes all of the fuel reactants. complex ion – Complex ions are ions with a central metal ion bonded to one or more molecules or ions. Example: The copper amine ion, Cu(NH3)62+ is a complex ion. composite material – Composite material is a type of material made from two or more other different materials which remain distinct from each other after joining. Example: Concrete is a composite material made from cement, water, and an aggregate. comproportionation – Comproportionation is a chemical reaction between two reactants containing the same elements but different oxidation numbers to form a product. Comproportionation is the reverse reaction of a disproportionation reaction. concentrated – Concentrated refers to a relatively large quantity of substance present in a unit amount of mixture. concentration – The amount of a substance per defined space. Concentration usually is expressed in terms of mass per unit volume. condensation – Condensation is the change in the state of matter from the gas phase to the liquid phase. condensation reaction – A condensation reaction is a chemical reaction between two compounds where one of the products is water or ammonia. Condensation reactions are also involved in the production of many polymers. condensation polymer – A condensation polymer is a type of polymer formed from condensation reactions between two monomers. condensed formula – The condensed formula of a molecule where symbols of atoms are listed as they appear in the molecule’s structure with bond dashes omitted or limited. Example: Hexane is a six carbon hydrocarbon chain with molecular formula is C6H14. The condensed formula is CH3(CH2)4CH3. conductor – A conductor is a material which permits a flow of energy. A material which allows the flow of charged particles is an electrical conductor. A material which allows the transfer of thermal energy is a thermal conductor or heat conductor. Also known as: Electrical conductors, thermal conductors, and heat conductors are all forms of conductors. conformation – Conformation refers to the different shapes a molecule can attain when groups of atoms are rotated around a single bond. conformer – A conformer is an isomer of a molecule that differs from another isomer by the rotation of a single bond in the molecule. congener – A congener is a group of elements in the same periodic table group. Example: Potassium and sodium are congeners of each other. A congener can also refer to a class of compounds with similar structures and similar chemical properties. Example: The class of chemicals called polychlorinated biphenyls (PCBs) have over 200 congeners. conjugate – In chemistry, a conjugate refers to a compound formed by the joining of two or more chemical compounds or the term conjugate refers to an acid and base that differ from each other by a proton. conjugate acid – A conjugate acid is the acid member, HX, of a pair of compounds that differ from each other by gain or loss of a proton. A conjugate acid can release or donate a proton. conjugate base – A conjugate base is the base member, X–, of a pair of compounds that transform into each other by gaining or losing a proton. The conjugate base gains or absorbs a proton in a chemical reaction. Example: The chemical reaction between a conjugate acid and a conjugate base is: HX + H2O ↔ X− + H3O+. conjugated system – A conjugated system is a system of connected delocalized electrons in a molecule with alternating single and multiple bonds. Conjugated systems are formed when pi bonds form across an intervening sigma bond. The pi bonds overlap each other and the electrons no longer belong to any one particular atom in the system. Lone pairs, carbocations, and radicals can also participate in a conjugated system. In larger atoms, conjugation can also involve overlapping d-orbitals. conservation of energy – Conservation of Energy is a law which states energy cannot be created or destroyed but may be changed from one form to another. conservation of mass – Law of Conservation of Mass is a relation stating that in a chemical reaction, the mass of the products equals the mass of the reactants. constant variable – A controlled variable is one which the researcher holds constant (controls) during an experiment. It is also known as a constant variable. Example: Temperature is a common controlled variable. If a temperature is held constant during an experiment it is controlled. continuous spectrum – Continuous spectrum is a broad range of light frequencies. The most common range is the visible light spectrum in the form of white light. contributing structure – A contributing structure is a Lewis structure that is a basic component of a resonance set of Lewis structures describing delocalized electrons. controlled variable – Another term for constant variable. See definition above. convection – Convection is the transfer of heat energy due to the motion of the heated material. Example: Convection ovens cook food by heating the air around the food. The heated air transfers its heat to the food by convection. conversion factor – A conversion factor is a numerical ratio to express a measurement from one unit to another unit. Example: To change a time measurement from hours to days, a conversion factor of 1 day = 24 hours. The part of the equation (1 day/24 hours) is a conversion factor. coordination bond – A coordinate bond is a covalent bond between two atoms where one of the atoms provides both electrons that form the bond. coordination complex – A coordination complex or metal complex is a chemical species consisting of a central atom or ion bonded to surrounding molecules or ions. The central atom of a coordination complex commonly is a metal cation. Various ligands or complexing agents may surround the central atom of a coordination complex. coordination compound – A coordination compound is a compound containing one or more coordinate bonds, which is a link between a pair of electrons in which both electrons are donated by one of the atoms. Examples: most metal complexes or compounds except for alloys. Specific examples include hemoglobin and Ru3(CO)12.
coordination number – The coordination number of an atom in a molecule is the number of atoms bonded to the atom. Example: Carbon has a coordination number of 4 in a methane (CH4) molecule since it has four hydrogens bonded to it. copernicium – Copernicium is the name for the transition metal element with atomic number 112 and is represented by the symbol Cn. Copernicium’s former name was ununbium (Symbol Uub). copolymer – A copolymer is a polymer that is derived from two or more different monomers. copper – Copper is the name for the transition metal element with atomic number 29 and is represented by the symbol Cu. corrosion – Corrosion is the irreversible damage or destruction of living tissue or material due to a chemical or electrochemical reaction. corrosive – Corrosive is a substance that has the power to cause irreversible damage or destroy another substance by contact. Examples: Strong acids and bases are corrosives. coulomb – The coulomb is a derived SI unit of electrical charge. A coulomb is the amount of charge moved by an electric current of one ampere in one second. The symbol for coulomb is a capital C.
Example: An electron carries a charge of -1.6 x 10-19 coulombs. Coulomb’s law – Coulomb’s Law is a law stating the force between two charges is proportional to the amount of charge on both charges and inversely proportional to the square of the distance between them. r = distance between the two charges. covalent bond – A covalent bond is a chemical link between two atoms in which electrons are shared between them. Example: There is a covalent bond between the oxygen and each hydrogen in a water molecule (H2O). Each of the covalent bonds contains two electrons – one from a hydrogen atom and one from the oxygen atom. Both atoms share the electrons. Examples: Water, sucrose, and DNA are covalent compounds. covalent radius – The covalent radius refers to the size of atom that forms part of a covalent bond. Covalent radius is expressed in terms of picometers or angstroms. In theory, the sum of two covalent radii should equal the covalent bond length between two atoms, but in practice, the length of the bond depends on the chemical environment. cracking – Cracking is the process where covalent bonds are broken in hydrocarbons to produce smaller hydrocarbons. crenation – Crenation is the term used to describe an object having a scalloped or round-toothed edge. 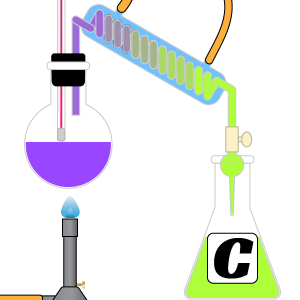 In chemistry, crenation describes what happens to a cell or other object when it is exposed to a hypertonic solution. In biology and zoology, the term refers to an organism displaying the shape (such as a leaf or shell). critical mass – Critical mass is the minimum mass of fissionable material required to maintain a nuclear chain reaction. critical molar volume – The critical molar volume is the volume of one mole of an element or compound at its critical temperature and critical pressure. critical point – The critical point or critical state is the point at which two phases of a substance initially become indistinguishable from one another. Example: The meniscus between steam and water vanishes at temperatures above 374°C and pressures above 217.6 atm, forming what is known as a supercritical fluid. critical pressure – The critical pressure of a substance is the pressure at a substance’s critical point. Example: The critical pressure of hydrogen between the liquid and gas phase is 12.8 atm or 1300 kPa. critical temperature – The critical temperature of a substance is the temperature at a substance’s critical point. Example: The critical temperature of hydrogen between the liquid and gas phase is −239.95 °C (33.2 K). cross-link – A cross-link is a bond that connects one polymer chain with another. crown ether – A crown ether is a cyclic compound comprised of ether groups. Crown ethers got their name from the way the molecules attach themselves to metal ions like a crown on the metal’s head. crude oil – Crude oil or petroleum is any naturally-occurring flammable mixture of hydrocarbons found in geologic formations, such as rock strata. Most petroleum is a fossil fuel, formed from the action of intense pressure and heat on buried dead zooplankton and algae. Technically, the term petroleum only refers to crude oil, but sometimes it is applied to describe any solid, liquid or gaseous hydrocarbons. Petroleum consists primarily of paraffins and naphthenes, with a smaller amount of aromatics and asphaltics. The exact chemical composition is a sort of fingerprint for the source of the petroleum. cyrogenics – Cryogenics is the study of the properties of matter at very low temperatures. cryogenic gas – A cryogenic gas is a gas that has been cooled to a liquid state below 150 Kelvin. Example: Liquid nitrogen is a cryogenic gas. crystal – A crystal is a substance in which the constituent atoms, molecules, or ions are packed in a regularly ordered, repeating three-dimensional pattern. Most crystals are solids. Examples: Quartz, rock candy, halite are all crystals. crystal field splitting – Crystal field splitting is the difference in energy between d orbitals of ligands. Crystal field splitting number is denoted by the capital Greek letter Δ. Crystal field splitting explains the difference in color between two similar metal-ligand complexes. Δ tends to increase with oxidation number and increases down a group on the periodic table. crystallize – Crystallization is the slow precipitation of crystals from a solution of a substance. Crystallization can also refer to the solid-liquid separation and purification technique in which mass transfer occurs from the liquid solution to a pure solid crystalline phase. crystallization water – Crystallization water is water that is stoichiometrically bound into a crystal. Crystal salts containing crystallization water are called hydrates. Example: Commercial root killers often contain copper sulfate pentahydrate (CuSO4·5H2O) crystals. The five water molecules are called water of crystallization. crystals of silver – Crystals of silver is the deprecated chemistry term for the compound silver nitrate, AgNO3. Also known as: Lunar crystals is another deprecated term for silver nitrate. cubic centimeter – A cubic centimeter is a unit of volume enclosed by a cube with one-centimeter sides. Cubic centimeters are abbreviated as either cc or cm3. cupric – Cupric is a deprecated term for the copper(II) ion. Cupric compounds are compounds containing copper in the +2 oxidation state. cuprous – Cuprous is a deprecated term for the copper(I) ion. Cupric compounds are compounds containing copper in the +1 oxidation state. cuprum – Cuprum is the old Latin name for the element copper. Cuprum is the source of the symbol Cu for copper on the periodic table. curie – A curie (Ci) is a non-SI unit of radioactivity. 1 Ci = 3.7 x 1010 becquerels or disintegrations per second. Curie point – The Curie point is the temperature above which a ferromagnetic material loses its ferromagnetism. curium – Curium is the name for the actinide element with atomic number 96 and is represented by the symbol Cm. current – Current is the rate of flow of electricity. The unit of current is the ampere (A) which is defined as 1 ampere = 1 coulomb per second. cyanate – Cyanate is the name of the -O-C≡N functional group. Cyanate also refers to the anion [OCN]–. cyanide – Cyanide is an ion with a -1 charge which contains one atom of carbon bound to one atom of nitrogen. Cyanide also refers to any compound that contains CN– ions. cycloalkane – A cycloalkane is an alkane containing a ring of carbon-carbon bonds. cycloalkene – A cycloalkene is an alkene whose carbon atoms are bonded into rings. cys – Cys is an abbreviation for the amino acid cysteine. Cysteine is also abbreviated as C.
cysteine – Cysteine is a naturally occurring amino acid characterized by having a -SH group on its side chain. Common Misspellings: Cysteine is a different amino acid from cystine. cystine – Cystine is a naturally occurring amino acid characterized by a disulfide bridge group (-S-S-) on its side chain. Cystine is formed by the condensation of two cysteine residues.